I have three teen boys of my own besides one from down the block, and he's here so much we just started calling him our own as well. All four boys are gamers. When I was younger we played Mario Brothers, I think we had to save a princess. Nothing too serious. Now a days they have profiles they seem to continuously be working on with some of the games and they have tournaments and game quest they can join online. There is a lot too this gaming world these days. I don't know the half of it. I was grateful to have their expertise for the following review. We are reviewing the Enhanced Wired Controller for Xbox one/PC from PowerA. 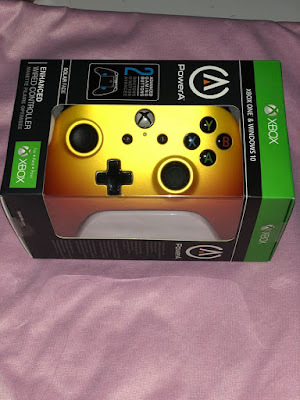 These Enhanced Wired Controller from PowerA introduce a new form factor that is familiar, feels comfortable holding it and is available in a variety of styles and colors. These are officially licensed Xbox controllers featuring two mappable advanced gaming buttons on the back, dual rumble motors and 3.5mm stereo headset jack to enhance your gaming experience. The controller has a precision tuned analog sticks, a shaped D pad and standard shoulder, button and trigger layout. Its familiar yet it does have it's differences that make it great for gaming. It comes with a two year limited warranty which is nice to have whenever your buying for kids and teens. The programmable buttons are on the left and right side of the back. The boys say there are many different reasons why this feature is great. This features the fully functional analog sticks and 8 way D pad. It has a small LED indicator light located between the menu and view buttons. This will let you know that the controller is on and when your programming the extra buttons. All of these buttons feel just as they should. One of the things my boys were very excited about was that this controller has a cord. This means limitless play time. There are no batteries required, I like that part. 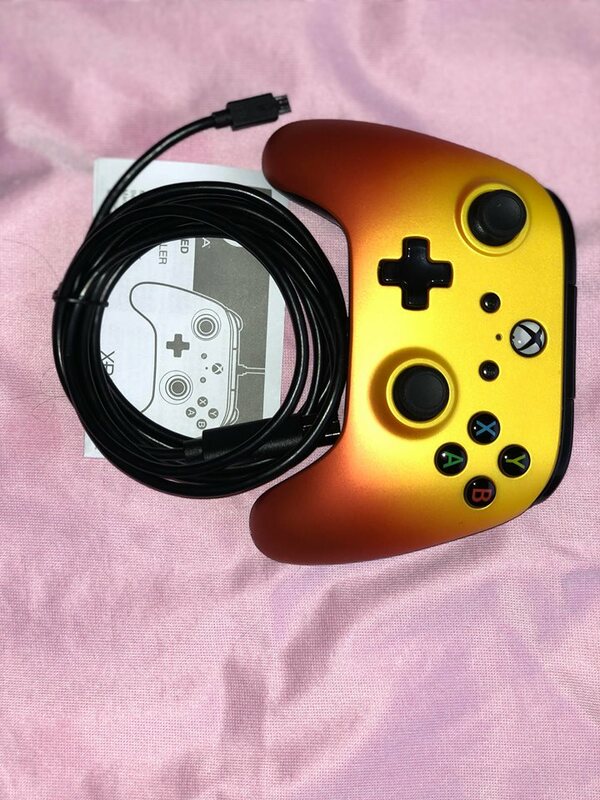 The cord is 9.8 feet and disconnects at the controller. The over all thoughts on the these controllers are great. It has worked wonderful. The features are what these gamers are liking. I also like that I'm not hearing they need money for batteries every couple of days. 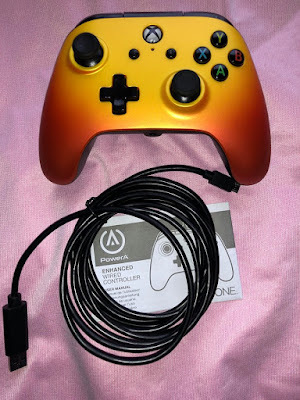 The styles and colors are awesome as well, which really make these even more attractive than the standard Xbox controller. The cord is very long, this could save an accident. PowerA is made up of very different individuals who come together for one purpose, to build innovative accessories for the worlds best interactive entertainment. I can relate. I turn to my niece or nephews to figure out the gaming stuff, lol. They would love this. My nephew would like this. However I like the old game controllers with one button and a joystick.Just move and fire away. These new controllers are too complicated for me. We have a xbox. I really love the look of this controller. Sounds like a great controller. 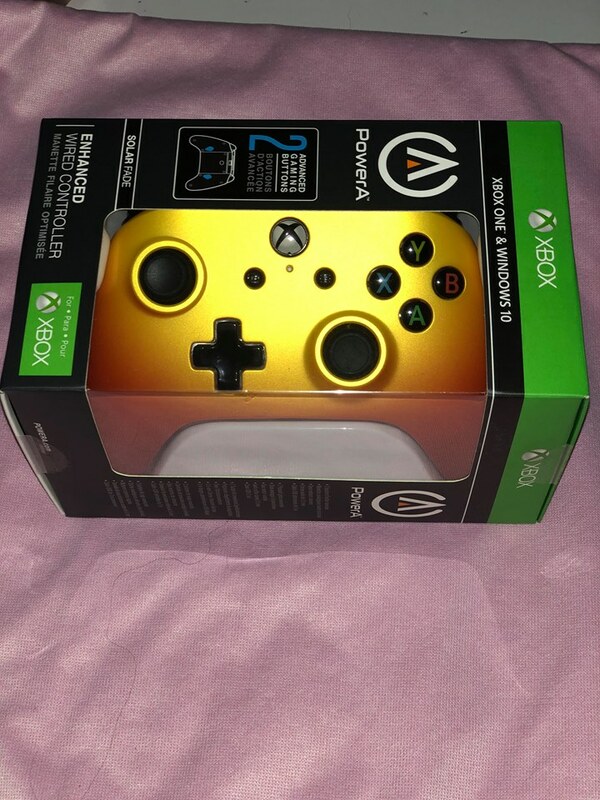 My 17 year old daughter is a gamer, and would love a controller like this. And while wireless controllers are nice, I agree they tend to eat up the batteries, so this having a cord is a good thing. Plus the color is pretty neat too!